DIARY: The meaning of Gentleman’s Portion. A Gentleman’s Portion is a free pouring of liquor, usually scotch or brandy, where the bartender does not use a measure. It may not amount to as much as a double, but it seems generously more than a single. The origin of this English expression is difficult to trace, but it probably comes from a time before legal liquor measurements were introduced. Applied to food, it refers to a good helping, but not a greedy one, suitable for a gentleman about to engage in some vigorous endeavour and needing the calories. Perhaps a day out hunting. If you want to know what a good pour or helping looks like, it’s useful to know what a standard measure is.Trying to determine what a single and a double actually are depends very much on where you live and is not always a straight two for one ratio. In the UK, famous for tiny measures, a single has been legally defined since 1963 as 1/6 gill (23.7 ml) and a double as 1/4 gill (35.5 ml), although this has now been replaced by 25 ml and 35 ml for single measures with landlords being able to decide which quantities they dispense. Naturally in Ireland the measures are more generous: 35.5 ml for a single glass and 71 ml double glass. In the US there is a wide variance across the states on the size of a shot, also called a pony, which is generally agreed to be 1 oz (29.5 ml by way of comparison). However, most bars pour a jigger of 1 1/2 oz (44.5 ml). In Canada, most provinces follow Ontario’s lead where a shot generally refers to a measure of 1 1/2 oz, though many establishments serve a smaller size so-called “standard drink” of only 1 oz. At home in Toronto, I always pour a Gentleman’s Portion for my guests, especially of my favourite scotch, and I don’t even own a measure. Diane was unsure how to cope with my large collection of single malt scotches. So she consigned the overflow from the liquor cabinet to a bucket – a very nice large antique wooden bucket, but a bucket nevertheless. The bucket probably holds seven or eight bottles and only the ones that are open and in use. The sealed ones stay in the cabinet. After dinner the bucket comes to the table for guests to enjoy. Aberfeldy 12, a highland single malt from Perthshire used in blending in Dewar’s White Label. I have Limited Edition bottle No. D59435. Owned by Bacardi, who bought it from Diageo. Auchentoshan Springwood, a lowland single malt from Dalmuir, Glasgow, aged in Bourbon casks, the only scotch to be triple distilled. Springwood, bought at an airport duty free shop may be an export name for their Classic as it doesn’t appear on their website. Also comes in 12, 18 and 21 year old expressions. Owned by Suntory. Auchroisk 28, a very rare Speyside single malt, now discontinued. The 10 year old from this relatively new (1974) distillery is used in the J&B Rare blend, my favourite inexpensive blended scotch for everyday drinking. There’s very little left of the 28 year old as I write. Owned by Diageo. The Balvenie Signature 12, a Speyside single malt from Dufftown is matured in three different casks, sherry, first fill and refill bourbon. I was introduced to this scotch by malt master David Stewart himself, who has just celebrated his 50th anniversary in the job with a 50-year old release (in Canada, sold only in BC). Owned by independent distillers William Grant & Sons. Highland Park 18, an island single malt from Kirkwall, Orkney Islands, Scotland’s northernmost distillery named ‘Best Spirit In The World’ by American whisky expert Paul Pacult in Spirits Journal 2005 and again in 2008.Owned by The Edrington Group. The Singleton of Glendullan 12, another Speyside single malt from Dufftown. Aged in sherry and bourbon casks, the distillery’s output is mostly blended into Bell’s. Owned by Diageo. Té Bheag (pronounced Chey Vek), a blended whisky from Skye, one of Scotland’s western isles the name means a wee dram in colloquial Gaelic. Islay, island, highland and Speyside malts are used in the blend. Owned by the family run Gaelic Whisky Company. To my mind, single malts are rather like fine cognac. Something to be savoured slowly at the end of a good meal, when the various flavours can enhance the meal. There’s the official Scots way to taste a single malt allowing just a drop of spring water to release the flavours (and BTW it’s officially called a “nosing”), but I’m not a Scotch snob and if a guest wants a cube of ice or two in his glass, that’s fine. If they want it with cola, then I’ll fob them off with a cheap rye whisky. There is a limit to one’s tolerance. Experts can find many distinct flavours in scotch – honey, butterscotch, toffee, chocolate, vanilla, spice, candy apple and many more. I confess to an inability to find these subtle hints. I use this flavour map which is easily the best way I’ve found for explaining four basic whisky designations – smoky, light, delicate and rich. The single malts I enjoy most are all from the light and delicate axis, with Auchentoshan being my absolute favourite. Sadly the 10 year old expression shown here is no longer available. Some of the single malts in my scotch bucket are smoky and rich and although they are wonderful to enjoy, I save them for my guests. For everyday drinking, after say 5 pm, and before dinner I enjoy blended scotches. Top of the line for me is Johnny Walker Black Label said to be the most popular whisky brand in the world. I also have a bottle of Blue Label, which I have yet to open. Perhaps on an auspicious occasion. For an inexpensive daytime bar scotch I like J&B Rare, which is a blend of 42 single malt and grain whiskies, made principally for the export market and popular in the US, Spain and the Caribbean. 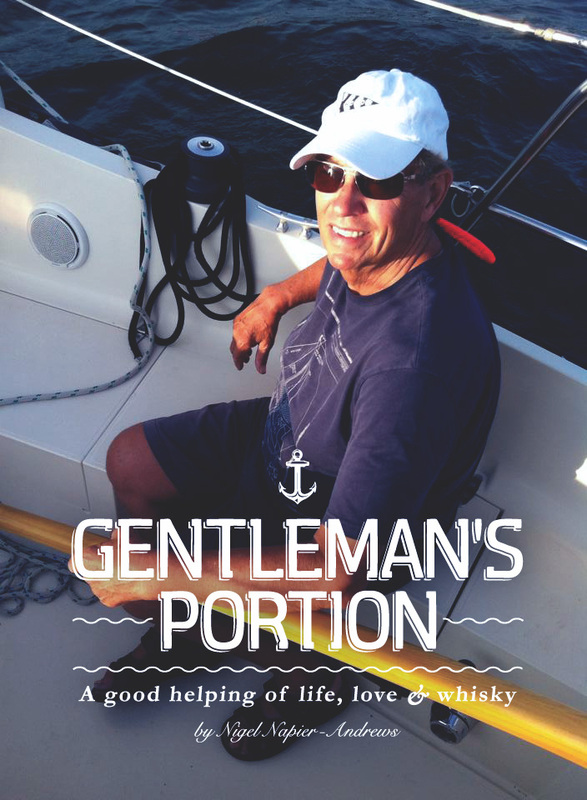 I liked Gentleman’s Portion as the overall title for my good living and food blog, which with your encouragement will continue with regular postings. This article was originally posted on December 1, 2012, my very first blog.